People are people and therefore inheritantly biased -no matter their occupation. The devil hates the Jewish people with a passion. The Jews are the ones who gave mankind the Bible and the Savior, Jesus Christ. It should come as no surprise that nations who are demonically controlled would share in the devil's hatred of Israel. I've listed a number of popular myths about Israel, and I've also provided facts to counter those lies. "The land of Israel is really the land of Palestine." The term "Palestine" is derived from the Philistines, an Aegean (Greek) people who, in the 12th Century BC, settled along the Mediterranean coastal plain of what is now Israel and the Gaza Strip. In the second century AD, after crushing the last Jewish revolt, the Romans first applied the name Palaestina to Judea (the southern portion of what is now called the West Bank) in an attempt to minimize Jewish identification with the land of Israel. The Arabic word Filastin is derived from Latin. There is no language known as Palestinian. There is no distinct Palestinian culture. There has never been a land known as Palestine governed by Palestinians. Palestinians are Arabs, indistinguishable from Jordanians (another recent invention), Syrians, Lebanese, Iraqis, etc. Furthermore, The Arabs invented the term after the fact. The so-called Palestinians lived mostly in Jordan and Syria. Yasser Arafat, the late leader of the so-called “Palestinians", was actually an Egyptian! "The Jews have no historic claim to Israel." Only one group of people have continuously lived in Israel for the past 3,700 years - the Jews. Jerusalem, in particular, has had a Jewish majority since the 1840s, 40 years prior to the beginnings of Zionism. Seventy-five percent of the land in east Jerusalem, which the press calls "historically Arab east Jerusalem," has been owned by Jews since 1947. The nations that inhabited the land prior to the Jews are no longer in existence, for they have been absorbed into various other peoples throughout the millennia. The Arabs of Israel only came to the land in 632 with the Muslim invasion. "The creation of the state of Israel in 1948 changed political and border arrangements between independent states that had existed for centuries." The boundaries of most Middle East countries were arbitrarily fixed by the Western powers after Turkey was defeated in World War I and the French and British mandates were set up. The areas allotted to Israel under the UN Partition Plan had all been under the control of the Ottomans, who had ruled Palestine from 1517 until 1917. When Turkey was defeated in World War I, the French took over the area now known as Lebanon and Syria. The British assumed control of Palestine and Iraq. In 1926, the borders were redrawn and Lebanon was separated from Syria. Britain installed the Emir Faisal, who had been deposed by the French in Syria, as ruler of the new kingdom of Iraq. In 1922, the British created the emirate of Transjordan, which incorporated all of Palestine east of the Jordan River. This was done so that the Emir Abdullah, whose family had been defeated in tribal warfare in the Arabian peninsula, would have a kingdom to rule. None of the countries that border Israel became independent until this century. Many other Arab nations became independent after Israel. "Israel violates the human rights of the Palestinian Arabs." The facts are different. Israel granted full citizenship to all of the Palestinian Arabs who fell within its borders after the War of Independence. Arabic is an official language in Israel. Israel remains to this day one of the few countries in the Middle East where Arabs can legitimately vote--and it is the only one where women can vote. "The West Bank is part of Jordan." The West Bank was never legally part of Jordan. Under the UN's 1947 Partition Plan--which the Jews accepted and the Arabs rejected--it was to have been part of an independent Arab state in western Palestine. But the Jordanian army invaded and occupied it during the 1948 war. In 1950, Jordan annexed the West Bank. Only two governments--Great Britain and Pakistan--formally recognized the Jordanian takeover. The rest of the world, including the United States, never did. During the 1950-1967 period of its occupation, Jordan permitted terrorists to launch raids into Israel. Amman lost the West Bank after the Jordanian army entered the 1967 war. "Jerusalem is Islam's third most holy city." Muslims try to connect Jerusalem to Islam by using a vague passage in the Koran, the seventeenth Sura, entitled "The Night Journey." It relates that in a dream or a vision, Mohammed was carried by night "from the sacred temple to the temple that is most remote, whose precinct we have blessed, that we might show him our signs. ..." In the seventh century, some Muslims identified the two temples mentioned in this verse as being in Mecca and Jerusalem. And that's as close as Islam's connection with Jerusalem gets--myth, fantasy, wishful thinking. Meanwhile, Jews can trace their roots in Jerusalem back to the days of Abraham. "The Temple Mount has always been a Muslim holy place and Judaism has no connection to the site." The area of Solomon's Stables is believed to date as far back as the construction of Solomon's Temple. According to Josephus, it was in existence and was used as a place of refuge by the Jews at the time of the conquest of Jerusalem by Titus in the year 70 A.D. More authoritatively, the Koran--the holy book of Islam--describes Solomon's construction of the First Temple (34:13) and recounts the destruction of the First and Second Temples (17:7). The Jewish connection to the Temple Mount dates back more than 3,000 years and is rooted in tradition and history. When Abraham bound his son, Isaac, upon an altar as a sacrifice to God, he did so atop Mount Moriah, today's Temple Mount. "Under Israeli rule, religious freedom has been curbed in Jerusalem." After the 1967 war, Israel abolished all the discriminatory laws promulgated by Jordan and adopted its own tough standard for safeguarding access to religious shrines. "Whoever does anything that is likely to violate the freedom of access of the members of the various religions to the places sacred to them," Israeli law stipulates, "is liable to imprisonment for a term of five years." Israel also entrusted administration of the holy places to their respective religious authorities. Thus, for example, the Muslim Waqf has responsibility for the mosques on the Temple Mount. "The Arab states have had to keep pace with an Israeli-led arms race." In most cases, the reverse has been true. Egypt received the Soviet IL-28 bomber in 1955. It was not until 1958 that France provided Israel with a squadron of comparable Sud Vautour twin-jet, tactical bombers. In 1957, Egypt obtained MiG-17 fighter planes. Israel received the comparable Super Mystere in 1959. Egypt had submarines in 1957, Israel in 1959. After the Egyptians obtained the MiG-21, the Israelis ordered the Dassault Mirage III supersonic interceptor and fighter-bomber. Egypt received ground-to-air missiles--the SA-2--two years before Israel obtained HAWK missiles from the United States. Later, Washington reluctantly agreed to sell Israel Patton tanks. "Israel's destruction of Iraqi nuclear facilities was an unjust act." Back in June 1981, after the Israelis bombed the plant at Osirak, the UN Security Council unanimously condemned Israel. Washington ostentatiously held up its delivery of armaments to Israel. A decade later, however, the strike looks awfully good. Had Saddam Hussein been armed with nuclear weapons during the war with Iran, much of Tehran would now be obliterated and large sections of Iran annexed to Iraq. More: Iraqi forces might have rolled straight from Kuwait into Saudi Arabia, long before American forces could have arrived. Today, Saddam could already control five oil-rich countries and thereby over half of the world's oil reserves. Economic disaster would be one result; and American troops would have no good place to land. "Israel has been an expansionist state since its creation." Israel's boundaries were determined by the United Nations when it adopted the partition resolution in 1947. In a series of defensive wars, Israel captured additional territory. 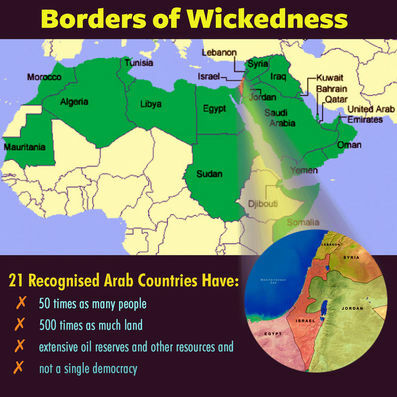 On numerous occasions, Israel has withdrawn from these areas. As part of the 1974 disengagement agreement, Israel returned territories captured in the 1967 and 1973 wars to Syria. Under the terms of the 1979, Israeli-Egyptian peace treaty, Israel withdrew from the Sinai peninsula for the third time. It had already withdrawn from large parts of the desert area it captured in its War of Independence. After capturing the entire Sinai in the 1956 Suez conflict, Israel relinquished the peninsula to Egypt a year later. In September 1983, Israel withdrew from large areas of Lebanon to positions south of the Awali River. In 1985, it completed its withdrawal from Lebanon, except for a narrow security zone just north of the Israeli border. That too was abandoned, unilaterally, in 2000. After signing peace agreements with the Palestinians and a treaty with Jordan, Israel agreed to withdraw from most of the territory in the West Bank captured from Jordan in 1967. A small area was returned to Jordan and the rest was ceded to the Palestinian Authority. The agreement with the Palestinians also involved Israel's withdrawal, in 1994, from most of the Gaza Strip, which had been captured from Egypt in 1973. "Israel is the aggressor in the current conflict." One: The Palestinians are the aggressors; they started the conflict, and they purposely drive it forward with fresh killing on an almost-daily basis. Two: The Palestinians regard this second intifada not as a sporadically violent protest movement, but as a war, with the clear strategic aim of forcing a scared and emotionally exhausted Israel to surrender on terms that would threaten Israel's viability. Three: As a tactic in this strategy, the Palestinians will not fight Israeli forces directly but instead have concentrated their efforts on murdering Israeli civilians. The greater the number, the more pathetically vulnerable the victims--disco-goers, women and children in a pizza restaurant--the better. Four: Israel has acted defensively in this conflict; and while Israeli forces accidentally killed Palestinian civilians, their planned lethal attacks have all been aimed only at Palestinian military and terror-group leaders. If you want to delve much deeper into the facts of history, click here. -The idea that Israel has been rejected for all eternity by God and forfeited all of His promises for not recognising Christ when He first came. Instead, The Church has replaced Israel and recieves all of 'former' Israel's blessings. Such Christians would do well to remember what The Bible- especially what Romans 11 actually says: That God has not rejected Israel- indeed that His promises to them are "irrevokable." "So I ask, God has not rejected his people, has he? Absolutely not! For I too am an Israelite, a descendant of Abraham, from the tribe of Benjamin. God has not rejected his people whom he foreknew! Do you not know what the scripture says about Elijah, how he pleads with God against Israel? "Lord, they have killed your prophets, they have demolished your altars; I alone am left and they are seeking my life!" But what was the divine response to him? "I have kept for myself seven thousand men who have not bowed the knee to Baal." and make their backs bend continually." I ask then, they did not stumble into an irrevocable fall, did they? Absolutely not! But by their transgression salvation has come to the Gentiles, to make Israel jealous. Now if their transgression means riches for the world and their defeat means riches for the Gentiles, how much more will their full restoration bring? Now I am speaking to you Gentiles. Seeing that I am an apostle to the Gentiles, I magnify my ministry, if somehow I could provoke my people to jealousy and save some of them. For if their rejection is the reconciliation of the world, what will their acceptance be but life from the dead? If the first portion of the dough offered is holy, then the whole batch is holy, and if the root is holy, so too are the branches. Now if some of the branches were broken off, and you, a wild olive shoot, were grafted in among them and participated in the richness of the olive root, do not boast over the branches. But if you boast, remember that you do not support the root, but the root supports you. Then you will say, "The branches were broken off so that I could be grafted in." Granted! They were broken off because of their unbelief, but you stand by faith. Do not be arrogant, but fear! For if God did not spare the natural branches, perhaps he will not spare you. Notice therefore the kindness and harshness of God-harshness toward those who have fallen, but God's kindness toward you, provided you continue in his kindness; otherwise you also will be cut off. And even they-if they do not continue in their unbelief-will be grafted in, for God is able to graft them in again. For if you were cut off from what is by nature a wild olive tree, and grafted, contrary to nature, into a cultivated olive tree, how much more will these natural branches be grafted back into their own olive tree? In regard to the gospel they are enemies for your sake, but in regard to election they are dearly loved for the sake of the fathers. For the gifts and the call of God are irrevocable. Just as you were formerly disobedient to God, but have now received mercy due to their disobedience, so they too have now been disobedient in order that, by the mercy shown to you, they too may receive mercy. For God has consigned all to disobedience so that he may show mercy to all. Oh, the depth of the riches and wisdom and knowledge of God! How unsearchable are his judgments and how fathomless his ways! that God needs to repay him? Let us now then consider such (sometimes emotionally based) objections against Israel's right to God's promises- which includes the land- refuted. Israel is by no means perfect, but like it or not God, still considers them to be His own for His special purpose. If after this, you still have your anti-Jewish agenda; so be it- it is your choice, but now you cannot say that you have not seen any strong evidence for Israel . I believe that God means what He says and says what He means..and I am concerned when I hear people- especially Christians who would deny what history itself and what GOD has plainly said in His Word concerning His chosen Jewish people.